Park Systems, world-leading manufacturer of Atomic Force Microscopes celebrated the grand opening of their European Headquarters on February 6, 2018 in Mannheim, Germany. The new office will serve as a central European AFM research facility, providing technical sales and service with a fully equipped Atomic Force Microscopy Nanoscience Lab on site. The ceremony was attended by many around Europe including from Deutsche Bank (Germany), Schaefer South-East Europe SRL (Romania), Milexia SAS (France), ST Instruments B.V. (Netherlands), Gambetti Kenologia Srl (Italy), Promenergolab LLC (Russia), Teknotip Analitik Sistemler Ltd. (Turkey) and Park Systems representatives from Europe, US and Asia. 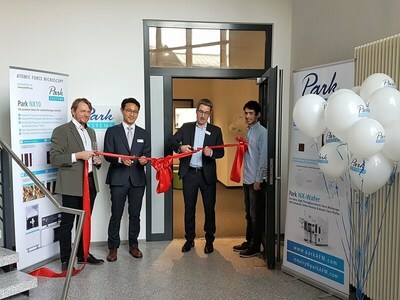 "The European scientific community plays a critical role in expanding cutting-edge science and research across many industries, particularly at the nanoscale," commented Ludger Weisser, the General Manager of Park Systems Europe at the ribbon-cutting ceremony. "The new Park Systems Nanoscience Lab in Europe is a landmark opportunity to provide the best-in-class AFM technology and unparalleled technical service for our European business partners to advance scientific research and development." The new office will provide technical, application and sales support for all European customers. As the demand for a modern AFM technology continuously grows in Europe, Park Systems recognizes the need of serving the key European scientific laboratories and research facilities with even stronger and direct support. "Park Systems has invested significant resources into the new Park Nanoscience Lab in Europe to offer the vast European scientific community a better opportunity to use our AFM product and make side-by-side comparisons to the well-known European AFM. We are confident that our AFM will demonstrate in Europe as it has in North Americaand Asia undeniable higher performance and cost efficiencies for research and production facilities," commented James Woo, Park Systems Global Sales Manager. "We invite European customers to our new Park Nanoscience Lab facility to use our equipment and witness for yourself why Park has been the world-leader in AFM technology since its inception." The Park Nanoscience Lab at the Europe Headquarters in Manheim Germany is a new branch of Park Systems and part of a growing network of Park Global Nanoscience labs including a recently opened Park Nanoscience Center at SUNY Polytech Institute in Albany, New York.The Park Nanoscience Lab will showcase advanced atomic force microscopy (AFM) systems, demonstrate a wide variety of cutting-edge applications - ranging from materials science, to chemistry and biology, to semiconductor and data storage devices - and provide hands on experience, training and service, year-round. It will be equipped with the latest Park AFM systems, including the Park NX20, Park NX10, and Park NX-Hivac, playing a crucial role in providing the best and direct technical, application and sales support to the European audience. "Besides the excellent AFM technology, having a direct and reliable contact partner for inquires of any matter was surely one of the most important factors for us when we chose Park Systems half a year ago," says Francesco Simone Ruggeri, the junior fellow at the University of Cambridge, UK, and Park NX10 AFM user. Park Systems, a global AFM manufacturer, has offices in key cities worldwide, including Santa Clara, California; Tokyo, Japan; Singapore; Manheim, Germany; and Suwon, South Korea. Since becoming the only public offering for an AFM business in 2015, its stock has increased by over 300% reflecting the strong growth of its business with many company-wide global initiatives for continued future word-wide success. Park Systems is a world-leading manufacturer of atomic force microscopy (AFM) systems with a complete range of products for researchers and industry engineers in chemistry, materials, physics, life sciences, and semiconductor and data storage industries. Park's products are used by over a thousand of institutions and corporations worldwide. Park's AFM provides highest data accuracy at nanoscale resolution, superior productivity, and lowest operating cost thanks to its unique technology and innovative engineering. Park Systems Corporation is headquartered in Suwon, Korea with its Americas headquarters in Santa Clara, California. Park's products are sold and supported worldwide with regional headquarters in the US, Korea, Japan, and Singapore, Europe and distribution partners throughout Europe, Asia, and America. Please visit http://www.parksystems.com or call 408-986-1110 for more information.